Having a late lunch at 2:30pm was not conducive for much of a dinner. But having driven from Port Angeles and enduring some wait at the Hood Canal Bridge as well as finding out that Hi-Lo's was prematurely closed meant we couldn't eat any earlier. Due to the scorching heat and the memories of an oven they call a restaurant in Kama'Aina, we decided to keep things close for the last meal of the day. Therefore, we took the short stroll to Fritz European Fry House for some quick affordable eats. 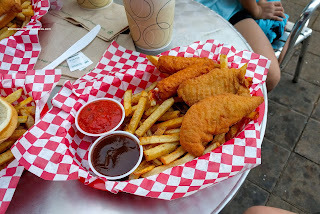 For my son, the Chicken Strip and Fried Mozza Sticks caught his eye. Something about fried food... Anyways, this wasn't a complex dish since it consisted of a pretty standard chicken strips which were crispy and fairly moist. The mozza sticks were crunchy and only a bit of cheese leaked out. 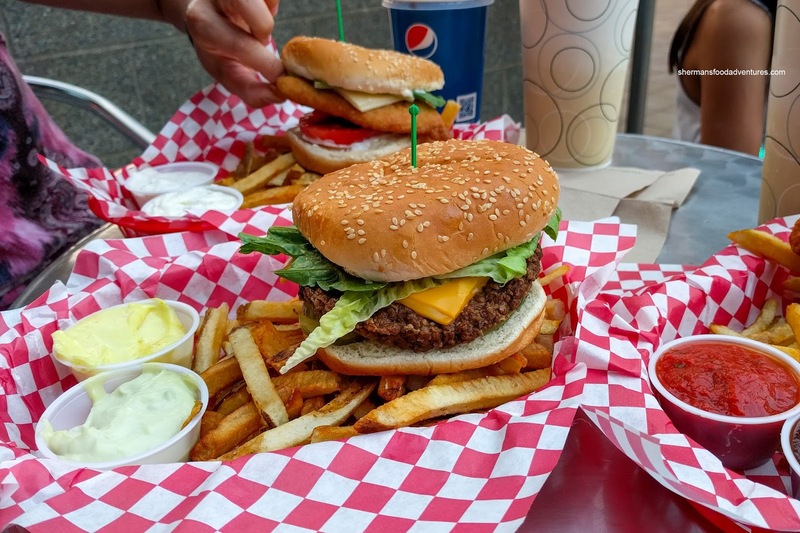 As for the fries, they ranged from crispy to some that were a bit soggy. I didn't mind them, but I would've liked to see more uniformly crispy Belgian-style frites. For his 2 dips, he had Marinara and BBQ which were pretty typical. 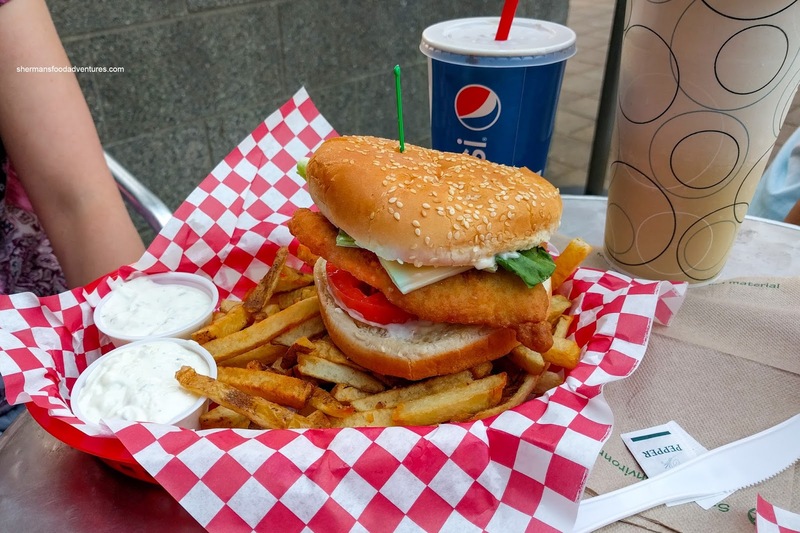 Viv and my daughter shared the Chicken Burger with Creamy Dill Ranch and Tartar sauce for the fries. Consisting of the same chicken strips, the chicken burger was also pretty standard. Both of the dips were solid, especially the creamy and tangy tartar. For myself, I had the Cheeseburger with Curry Mayo and Wasabi Garlic Mayo for the fries. Although the burger was also pretty typical, the patty was moist and somewhat smoky. I thought the dips were also very good with a balanced amount of curry in the mayo. My favorite was the wasabi garlic as it was exactly as advertised while being balanced as well. 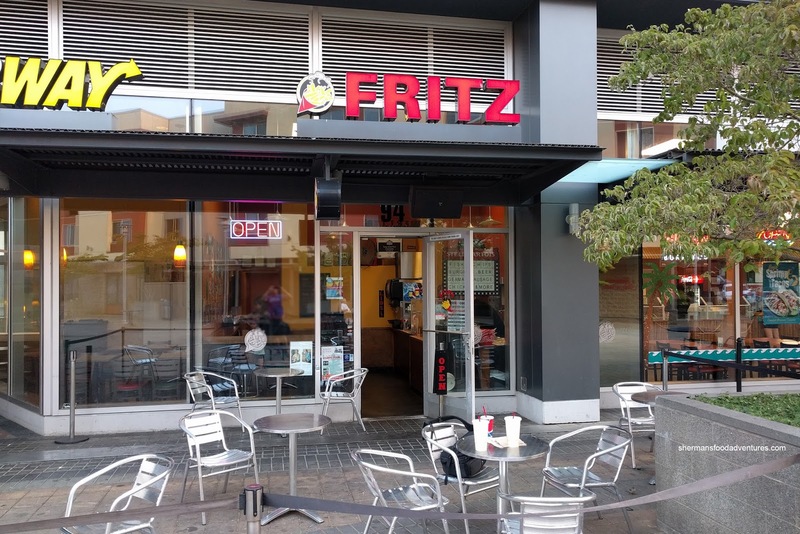 Overall, we found Fritz to be serviceable yet unremarkable. The dips were definitely the highlights as well as the reasonable prices. Just wished the fries were more crispy. 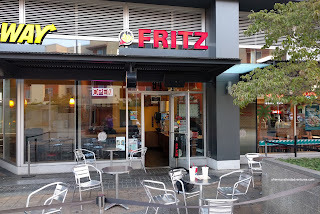 So is this actually a branch of Vancouver's Fritz EFH ? Interesting. Weird how the two have identical names. @LR Different country/city, lots of places named exactly the same. Not surprised.